Another flower that has earned its popularity in recent years. Not a very tall flower, but its performance is truly stunning. We have a fabulous source in Chile and have an exclusive relationship with a large grower in Italy. 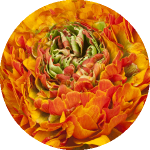 We also receive Ranunculus from California, from Holland and Ecuador, and even…from Japan! Just like with Peonies, don’t be alarmed what Ranunculus looks like upon arrival. The product is cut tight to ensure it doesn’t get damaged during shipping. Be careful when unwrapping Ranunculus as the product is very tender. But don’t worry: stick to these few basic rules, and the reward will be spectacular! Remove all the leaves from at least half the stems, making sure foliage does not touch the water to prevent bacteria growth. It might be helpful to hold the bunch upside-down to avoid breakage when you take the bunch apart. Just shake the bunch lightly and the stems should separate much easier. Cut off at least half to one inch from the stems, if they arrive short, cut half an inch in order to have enough stem left to work with.